Enjoy an exclusive retreat in this stunning, secluded venue in the heart of the Churnet Valley, Staffordshire – a designated area of outstanding natural beauty. Perfect for private parties or corporate away days, it offers comfort and style in picturesque surroundings. The ultimate in luxury accommodation, the Lodge is a comfortable haven for you and your party to relax and unwind after a day exploring the local area. A large open fire keeps you warm in winter, while the heated patio is perfect for summertime alfresco drinks. 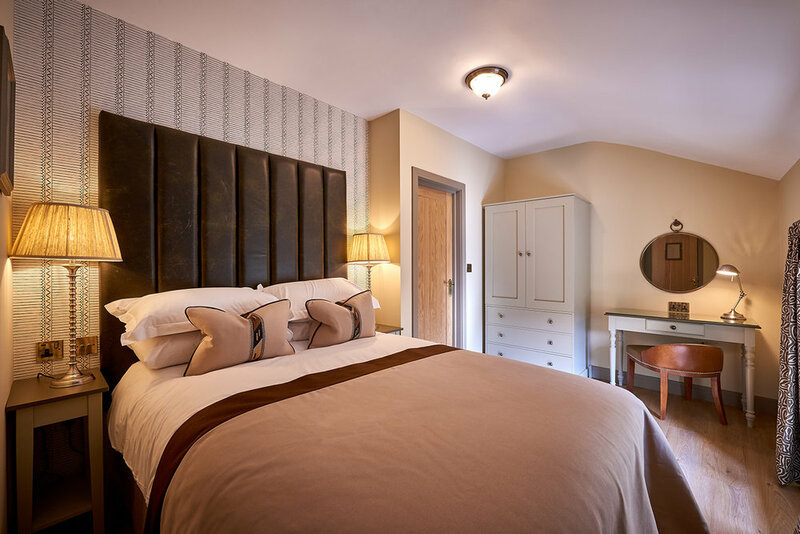 Our 16 individually designed rooms range from intimate and cosy to large and spacious, all beautifully furnished to promise a refreshing night’s sleep. Each is uniquely conceived, but all feature a luxury en-suite bathroom with fluffy towels and toiletries, Hypnos bed with Egyptian cotton linen, and flat-screen television, along with wi-fi and complimentary refreshments. The Churnet Valley is an area of outstanding natural beauty, a stunning landscape of flora and fauna that’s perfect for nature lovers, walkers and birdwatchers. Soak up the tranquil atmosphere as you enjoy the diverse wildlife across the grounds, with their specially developed lakes and walking routes. A relaxing break means no cooking, and our delicious selection of food promises you a tasty, hearty meal after a long day of walking. Using locally sourced produce and ingredients, our professional catering team create and prepare everything on site. Guests can even sample our home-grown, specially bred Longhorn beef. Our private dining room can host up to 25 guests, ideal for a special occasion. Your adventure starts here. Talk to us about your requirements, ask us about availability and costs, and find out more about our accommodation and what’s on in the local area. Get occasional promotions, new products and news delivered directly to your inbox. You can opt-out at any time.